If you are considering a bathroom remodel, or if you’re having a new bathroom constructed, you may be considering the frameless shower door. We have put together some considerations to help you in the decision making process. First, if you are renovating a bathroom, consider the markings your old shower door might leave in the tile or shower surround. If you didn’t previously have a shower door, then obviously this isn’t an issue. Will you need to patch holes, or possibly re-tile your shower? Make sure you think thru all aspects of your bathroom renovation. 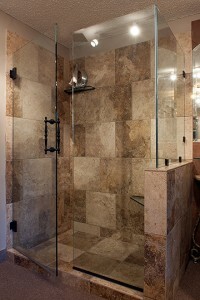 Will you be completely renovating your bathroom, or are you simply looking to replace your shower doors? If you are only replacing the shower doors, or perhaps doing a new shower door install but the rest of your bathroom is somewhat “dated” you may consider the standard framed shower door to keep the overall look of your bathroom consistent. If you are doing a complete bathroom renovation, then you will want to consider the frameless shower door. Not only are frameless shower doors oftentimes easier to maintain than the framed shower door, they are frequently much more aesthetically pleasing. Homeowners are seeing a much better return on their investment in a frameless shower door, as it has become a “must have” for many new home buyers. At Olathe Glass, our shower door installation experts have years of experience installing heavy frameless and framed shower enclosures and shower doors. We are happy to provide an in-home estimate, as well as answer any of your questions or concerns. Call or stop by our showroom today to begin your shower door installation or bathroom renovation project! Click here for a map and our contact information.